Common distractions such as fans, injuries, opponents etc. can be hard enough to block out. 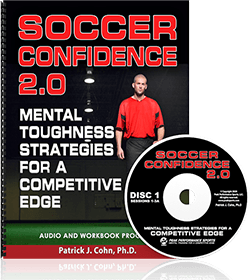 Then if you add the pressure of college coaches watching players perform, many soccer players struggle with their confidence. You can’t focus on your performance when trying to impress coaches or thinking about your future. Thinking about colleges is a very stressful time for high school athletes. You want to be confident and mentally prepared to perform your best in front of others who are watching you. Coaches look for athletes that can perform under adversity or tough situations. This is easier said than done for many soccer players who struggle with the pressure to produce when being scouted by college coaches. 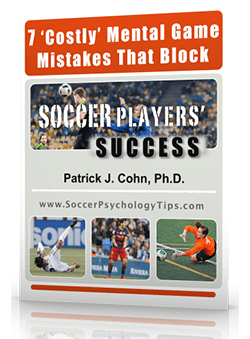 When college coaches are present, soccer players are often afraid to make mistakes. This leads to playing safe and tentative, often resulting in a poor performance. Many athletes–who have already committed to a school–sometimes feel they have to live up to the coach’s expectations by playing perfectly or scoring a goal. 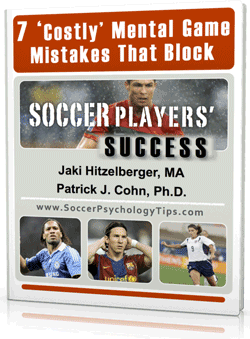 Soccer players often over-think their performance and judge each play wondering what the coaches are thinking. All in all, when soccer players are worried about how their performance is being perceived, they lose focus on the moment and what will help them execute on the field. How can you mentally prepare when playing under the pressure of college coaches watching you play? It is normal to feel more nerves when you know coaches are present, but the key is to focus on what you need to do on the field to perform your best. You want to approach the game with the same intensity and routines you use for any game, even if coaches are watching. Wanting to look like a stand out, trying too hard to score goals, or feeling you must be a star does not help you perform your best. When you start to think about people who are watching you, stop and refocus on your performance. Consider scouts or coaches as another distraction that you do not want to waist energy on. We know that your future in college soccer is important, but put it aside when you step on the field and just play your game. Staying confident when college coaches are watching is just one aspect of having a strong mental game. being watched by visiting college coaches. They should be guided and reinforced in having confidence in doing the ‘Right things”, which are simply to, as said here, to concentrate on teammates and opponents during the match, and in so doing, concentrate as always on simply making and using space with methods of legal deception. And, as is best practice always, have them visualize before the game so that they bring their minds as well as their bodies to instant and constant focus on the match. GIVE them some tools and methods of avoiding undue concentration upon outside forces (college coach watchers) by giving them some things to concentrate ON. Just saying to your players “Just don’t let them bother you”, is no help and not coaching at a time when they need help. They are kids, and we are there to think about and help them, especially in unusual situations. Forget about “YOUR WON AND LOST RECORD” coach, and think about how to guide your kids thru an unusual problem time for them.